1. This gorgeous and bold convergence of grasses was done by Robert Leeper Landscapes in Austin, Texas. 2. Nothing says “ATX” quite like a stunning view of Lake Travis. The asymmetric design of the stepping stones along with the native plants really complement then gorgeous natural view. This was done by McDugald-Steele Landscape Architects. 3. Sharp greens and cool blues complement each other on this Dripping Springs on this backyard setup by LawnPop Artificial Turf. 4. Austin Outdoor Design built this tremendous outdoor patio with fire pits. Can’t imagine that’d be a bad place to spend cool fall evenings. 5. This beautiful roof garden was done by Casey Boyter Gardens in Austin, TX, and features native plants and a thicker substrate designed to absorb large amounts of water (for those few times it reeeally rains for days at a time). 6. 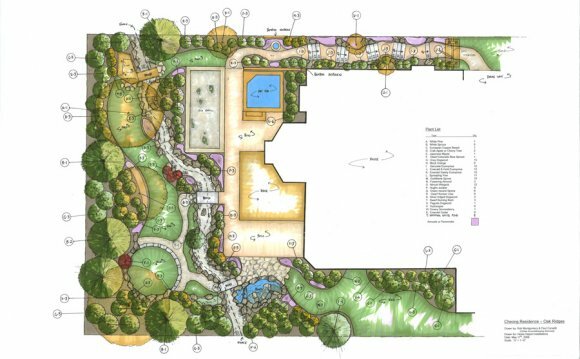 Though without a detailed description on Houzz, this landscape design’s beauty speaks for itself. The work was done at West Rim in Austin, Texas by Landscape Architecture. 7. This steel retaining wall was done by Pearson Landscape Services and features all the things that make Austin, TX great: Texas mountain laurel, Mexican feather grass, may night saliva and Iceberg roses.